We found another MGB Locost online. That makes two now. This Locost was apparently started around five years ago by a gentleman named Martin Keller, and finished just last year. The car seems to be close in design to Ken Walton's original MGB Locost, with a standard sized 'book' frame and a late-model donor. 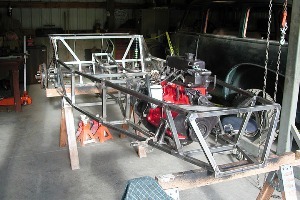 Unfortunately, like a lot of Locost web sites, this one is all pictures so it's hard to get the complete story of the build. But there are a lot of pictures. One story the pictures do tell is that the transmission tunnel needs to be big. Really big. Early photographs show the frame going together with a narrow opening for the tunnel, the middle "H" tubes less than a foot apart, which is about the width in the book. Later photos show the transmission in position, and those same tubes have been moved way apart, especially on the passenger side where the width of the footwell is down to about six inches. That may be overkill, but we did take a good look at our transmission tunnel design and moved things out a bit. Our only real concern is the driver's footwell, which is now at about 10" in our plans, which we think is about as narrow as you can go and still fit all of the pedals. 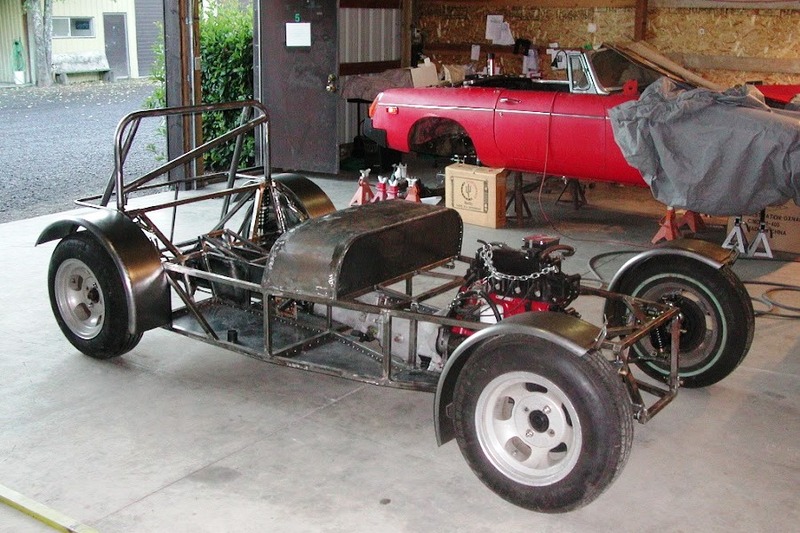 We'll cut all the tubes for the tunnel based on our current design, but I don't think we'll weld anything together until we have an actual MGB transmission on the premises. We hate to criticize anyone else's Locost, since we're kind of living in a glass house right now, but we had a couple of concerns with this car. 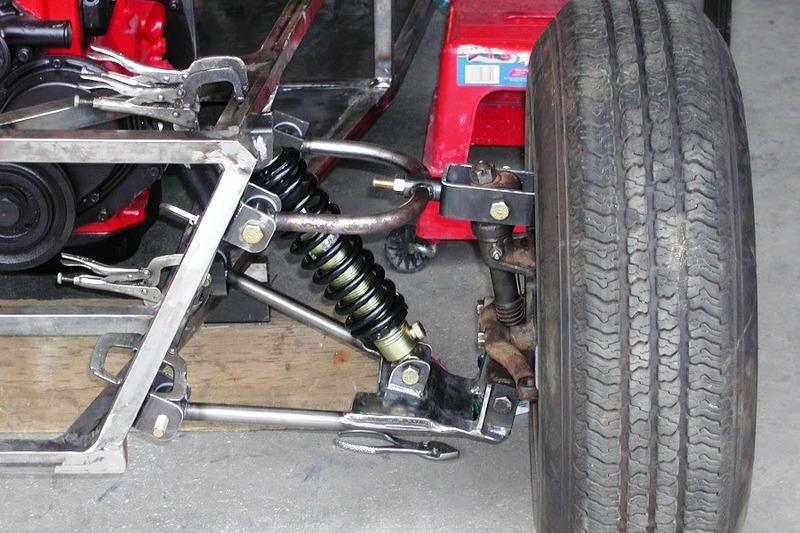 The first was with the front suspension. It's similar to the Ken Walton Locost in that it has no provision for fitting the upper trunion easily into the upper control arm, and apparently no built-in caster. The suspension pickup brackets appear to be in the standard book locations. That's got to make the handling a little twitchy. At least the front end looks like it's adjustable for camber. And the steering ought to be nice and light. 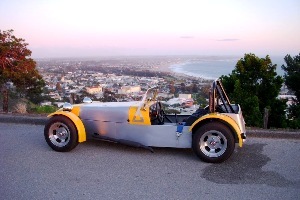 Since the MGB engine is too tall for a standard Locost, Ken Walton raised the hoodline of his car around 2". I thought that looked kind of awkward, and so apparently did Mr. Keller. 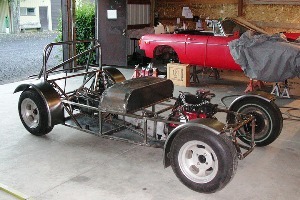 To solve the same problem, he lowered the engine in his Locost until the oil pan was skimming the ground. We're not sure that's such a hot idea. We want our Locost to be totally road-worthy. Imagine getting up early on a cool spring morning, and heading out for a quick blast out Lucas Valley Road, only to have our oil pan torn to pieces by a sharp rock and spill its guts all over the ground. You think we could get in trouble for this? The other somewhat sketchy detail on the car is the rear shock mounts. 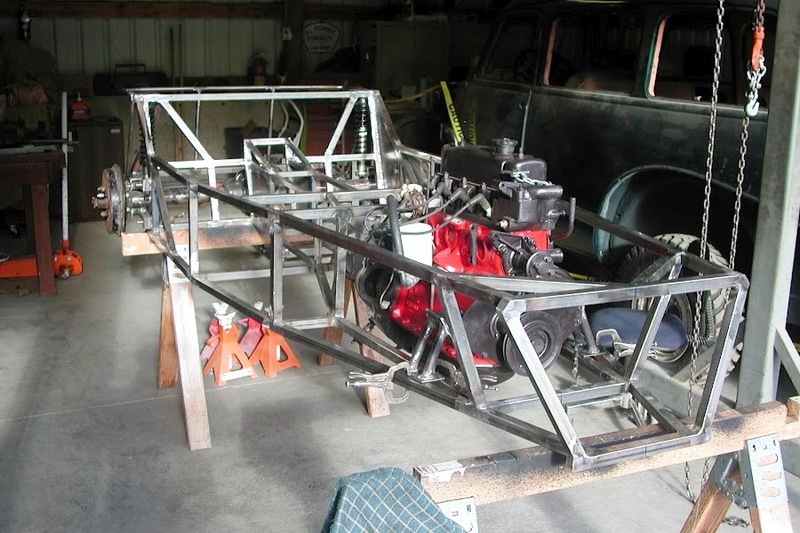 The upper trailing arm bracket that's welded to the differential is fitted with an extra-long bolt, extending two or three inches past the width of the bracket. The lower end of the shock is then attached to this bolt. So the entire weight of the car is resting on a cantilevered bolt. It looks like a good, healthy bolt, but that's a lot of bending stress. That has to fatigue and creep to the point where the shocks start to bind. Maybe not, though. Or maybe you just plan to replace the bolts every year or so. Of course these complaints are minor in the grand scheme of things, where actually completing a Locost and getting it on the road trumps criticism every time. We haven't had to face some of these details yet, like figuring out how to get enough shock travel in the rear suspension, so who knows how badly we'll do on our own. In any case Mr. Keller deserves his props. His website is an excellent resource and his M.G. Locost is a great source of insipration. One thing we'll definitely have to do, if we ever manage to finish building our Locost, is document whatever we did wrong, whatever bad decisions we made, all of those things we thought would be cool that turned out to not work, in the hope that whoever builds the next MGB Locost will learn from our mistakes. We expect there'll be more than a few of those down the line. We also hope some day to get a chance to take a few spectacular photos of our Locost, sitting high on a hill, overlooking the city at sunset. That would be very cool.